The streets are cold in London in October, and the nights are long and empty. In November the rains come, with a chilly wind off the Thames River. Only the poor are out and about, searching for the few pennies they need to buy shelter and food. The people of Whitechapel held their breath and waited for the terror that walked among them. They didn’t wait long. In their briefest form, these are the tales of the five Jack the Ripper murders. There are hundreds more stories, facts and clues. There are eyewitness accounts, police records and detailed autopsy reports. There has been enough information collected over the last century to fuel a whole industry – Ripperology. There are literally hundreds of theories. There’s the Masonic Theory – some sort of cover-up by the police members of the Masonic order. There’s the Jewish Theory – a blood sacrifice from some demented sect. There’s Leather Apron, a butcher gone mad, and Doctor Ripper, an insane surgeon. There’s even a theory that there was no Jack the Ripper at all: her name was Jill, and she was a deranged midwife. Over the years, many prominent Victorians have been accused of being Jack the Ripper. Those theories have reached even into the royal family and convicted the Duke of Clarence, Queen Victoria’s grandson, second in line to the British throne. Each of these theories comes complete with a written article or book, claiming to solve the mystery. Each one carefully documents the evidence; each one builds its case, and each one comes to its own conclusion. But each one unravels far faster than it was ever put together. Why? Too many things don’t fit; too many things are odd. There are too many coincidences, and too many “facts” are in conflict with what we know to be true. There are just too many impossibilities. Mary Ann Nichols and Annie Chapman were both killed and mutilated in less than 30 minutes — in the dark – and Chapman was killed on a busy thoroughfare on a Market Day morning. Catherine Eddowes was killed and her kidney surgically removed in less than 15 minutes! – once again, in the dark. One murder under these circumstances is possible; two, maybe. But three go beyond the realm of belief. On September 30th, 1888, how did Jack the Ripper commit murder, travel some distance through tangled streets and alleys, commit murder again and escape both times – unseen? It’s possible, but highly unlikely. Each killing is possible individually, but taken together – five? In the open streets of Whitechapel? That’s pretty far-fetched — especially since, after the first murder of Mary Ann Nichols, the entire community was on alert, watching, including several vigilante groups. The only murder that has any logical explanation is that of Mary Jane Kelly, who was killed in her room. But there is evidence that Mary Jane Kelly wasn’t even killed. Caroline Maxwell, of #14 Dorset, testified that she saw Mary Jane Kelly in front of Miller’s Court at 8:30 that morning and stopped and talked with her. Maxwell also testified that she saw Kelly again at 9:00 am, outside the Britannia Pub. Maurice Lewis testified that, at 10:00 am, he went into the Britannia Pub and saw Kelly inside, talking and drinking with some other people. These two independent testimonies cite the same pub; could two different people be so specific and so wrong? In another weird twist, Catherine Eddowes identified herself as Mary Jane Kelly when she left Bishopsgate police station. Why? Another coincidence? Perhaps, but how can there be so many? For example, all of the victims had sort of drifted into Whitechapel at around the same time. Nichols, Eddoes and Stride had all lived on Flower and Dean Street, within a few doors of each other. Their lives and habits were centered around Dorset, a short street off Commercial. They all frequented the Horn of Plenty and the Britannia Pubs and they all worked the streets of the area as prostitutes when they had to. Yet, there is no evidence that they even knew each other – although that doesn’t seem possible in a crowded, poor community. And there’s more, much more – including the Goulston Street graffiti and of course the letters. Each coincidence is possible, but, like the murders themselves, not all of them. The laws of anti-chance alone forbid it. So, even with only our cursory examination we can come to the same conclusion that every Ripper investigator has come to since the murders themselves. 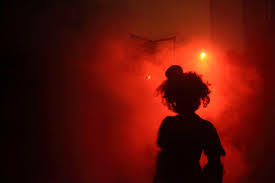 Some hideous evil stalked the streets of Whitechapel, London in the autumn of 1888. It killed women and then it stopped killing them. That’s it. There is nothing else. The mountain of evidence is so strange and contradictory that we cannot glean anything further from it – except, perhaps, that the murders could not possibly have happened the way they did. The amount of coincidence, happenstance and odd occurrence strains even the willing suspension of disbelief. No fiction could have been written so wildly. And the monster that called himself Jack the Ripper will remain anonymous, forever lurking in the shadows of time and the cold dark soul of our 4 o’clock in the morning. This is why we remember Jack the Ripper. He is the last resident of Evil. In our calm, clean, well-lighted world, we rehabilitate our criminals and sanitize our villains. We give them names and parents. We seek their motivation and try to understand their desperate minds. We hold them to be one of us, tricked, by the very society that condemns them, into performing hideous acts. Our world has no room for monsters, or fiends or the tortures of Hell. But Jack the Ripper defies us all by his very existence. In 2006, the BBC produced a documentary about Jack the Ripper. They used modern techniques of forensics, like geo-profiling and computer enhanced facial construction to reassess the 120-year-old crimes. They found that Jack the Ripper was an ordinary fellow who probably lived on Flower and Dean Street. He probably worked at a menial job and drank his gin at one of the pubs. They even produced a face. But Jack the Ripper will have none of this. He has no name, no family, no childhood, no face. No amount of empathy or good intentions can ever wash the blood from his hands. He alone still lives with the demons – and laughs — the last of his kind. Thomas McNeney, a.k.a. the Tomster, a.k.a. the Tominator, a.k.a. the Tomahawk. There’s a dandy little book, with grisly crime-scene photos, that discounts all the famous theories ( the American surgeon, the Duke of Clarence, Al Crowley, etc.). The author contends that Jack was a tradesman, cutting leather as I recall, in the East End, and that this chap went bonkers. A lunatic in the streets, who gave his name as Navin was admitted to Bedlam shortly after the last murder. Will try to get the title of the tome for you. It’s the most convincing theory I’ve heard of. 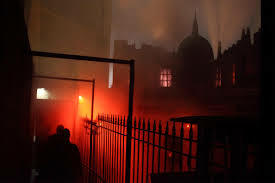 This entry was posted on November 8, 2013 by wdfyfe in History and tagged Horror, Jack the Ripper, London, Murder, Whitechapel.